To all intents and purposes, the quality of democracy will suffer and deteriorate as the criminal elements are world over entering the legislative bodies. In this context, India is no exception. In India’s boisterous democracy, the discourse over the role of criminals in politics is raging ahead although the comprehension of the underlying drivers is still inchoate. To study this phenomenon, the Indian government in 1998 appointed a committee under N. N. Vohra, who is currently serving as Governor of Indian administered part of Jammu and Kashmir. He confirmed the nexus between the lumpen elements and the politicians in Indian political system. The report remarked that criminal elements are entering the political market for standing above the law and making money. This has been believed to be the sole reason and explanation for the growing criminalization of politics and politics of criminalization. Given the relative underdevelopment of the North India, it was believed to be the epicenter of criminality in Indian politics because of the simple but erroneous logic poverty breeds criminality. This is a simplistic explanation. As poverty is ubiquitous in India, the report didn’t study the role of money and institutional flaws in the Indian democracy. It signifies that in exchange for doing their dirty work; criminals receive protection from state and a direct patronage regarding contracts, tenders, and giveaways. The geographical reach of the politicians under serious criminal cases is widespread. This makes it dicey to have any neat explanation that focuses on the regional culture of corruption or a tight relationship with relative backwardness and poverty. 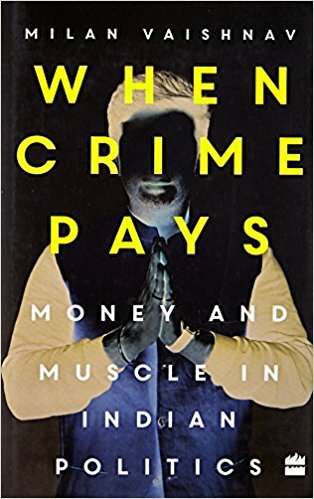 Milan Vaishnav’s has taken up the challenge whose book When Crime Pays: Money and Muscle in Indian Politics are beyond any shade of doubt path-breaking, as he has sought to do an autopsy of the issue holistically and study the cause of entry of criminal elements in Indian politics. One of the novelties of the democracy that makes it different from other forms of governments is it enables the people to exercise their choice. The explanation given by the early scholars for the entry of the criminals in elections was information asymmetry suffered by the voters at the time of voting, as democracy enables voters to weed out the rascals out, but it is a weak argument and simplistic explanation. Given this situation and context, why don’t voters prune the criminals from the electoral fray? Over the years this assumption has proved erroneous as the percentage of the criminals in Indian legislators at center, in states and at Panchayat and Municipality across the length and breadth of India has ballooned. The share of elected officials in India with pending criminal cases has been rising and not nosedived over time. The figure grew from 12 percent in 2004 to 34 percent in 2014. Criminalization of politics is not restricted to the national parties, as of nearly as many 31 percents of the MLA’s have criminal antecedents as well. In the academics, it has been believed in India that criminalization of Indian politics is a new phenomenon. However, the author’s contribution lies in the assertion that the interplay between the crime and politics is historical and not a new one as commonly believed but by 70s it was commonplace. The first general elections held in 1952 witnessed 1,250 cases of law and order incidents while polls were adjourned in 93 cases. There were scattered reports of Congress members contacting lumpen elements to coerce the voters, mobilize supporters. This got magnified only with the passage of time. 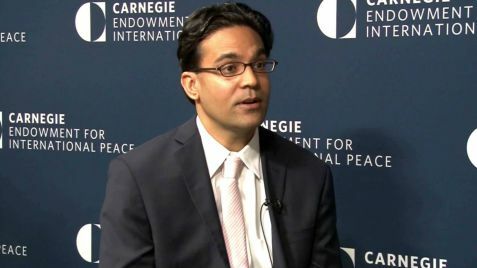 As India has witnessed the weakening of the hegemonic Congress Party and the corresponding growth of multiparty competition, organizational decline within the parties, deepening and broadening of identity politics, the decay of the rule of law and the collapse of India’s election finance regime are the various factors pulling such elements in elections. As electoral uncertainty increased over the years criminals sought to vertically integrate their operations, cutting out the politician middleman to maximize control over their survival and protection. What is the probability of the candidates with criminal antecedents to win elections in India? Candidates linked with criminal activities have strong chances of winning- a candidate with the criminal case has, on an average almost three times more likely to win elections against the candidate who faces no case. Given this equations every party competes with one another to embrace candidates under criminal scrutiny, but why. Money is the key reason parties are attracted to politicians with criminal antecedents. The costs of elections have risen over the years coupled with the competitiveness of the elections. This resource crunch has compelled all the parties to innovate in their desperate search for financial rents. While some of the funds raised are used to fight the elections, a part of the money finds a way into the pockets of party leaders. Essentially the rising cost of the election is virtually making it dicey for the common man to venture into this field as it is being closed by a governing class with the ballooning use of money in elections. Parties struggle to identify the reliable source of funding- they have put a premium on the candidates who can bring resources to the party and will not drain the resources limited party coffers. Candidates who are self-financing are not only able to cover their campaign costs but are in a position to pay their parties for the privilege of running and thereby subsidizing lesser endowed candidates. But beyond money, voters have reason to support the candidates with criminal background, in a context where the rule of law is weak and social divisions are highly ubiquitous, politicians can often use their criminality as a badge of honour-a signal of their credibility to protect the interests of their community and its allies casting themselves as modern-day Robin Hoods operating in a polarized society. This is a by-product of institutional failings of the Indian democracy to meet the needs of its citizenry in between elections. Underdeveloped institutions have been the Achilles heel of the Indian democracy from the outset. When the state fails to fulfill the core obligations of its citizens, the later will naturally begin to look for alternatives. World over morality and ethics have taken back seat. People generally won’t support candidates, who are honest as they are believed to be law abiding and fails to deliver the goods to their constituencies. They want their representatives should be a broker who is available and ready to bend the rules to fulfill the needs and demands of the people. Criminally suspect legislators seem to gain strength from the fact that they are perceived to be, rightly or wrongly, delivering governance to their constituencies. They seem to bridge the gap between the state and the society in ways that political parties increasingly struggle to do. Candidates with deep pockets can contribute their financial rents in numerous ways; in addition to plugging election funding gaps, they can directly pay to party leaders or can engage in rent-seeking behavior that could ultimately benefit the party. Candidates with criminality are better equipped and have better access to resources. When the state is unable to function impartially, voters are often willing to turn to someone who can substitute for the state, even if the candidate is linked with the illegal activity. Corruption and criminality are not mutually exclusive, but they are distinct analytical concepts. Corrupt activities might be criminal, but not all criminal acts are inherently corrupt. Before the seismic shift in the competitiveness of the Indian politics occurred and before the era of Congress hegemony came to end there was some degree of separation between the politicians and the criminals. That dividing line became blurred with the onslaught of the intense political contestation and fragmentation especially during the 1980s. In India political act of courting arrest as a method of civil disobedience even has its nomenclature, therefore, on the one hand, the fusion of politician and so-called criminal are considered culturally acceptable in India. The answer to the teaser as to why political parties nominate candidates with criminal backgrounds to stand for election painfully obvious: because they win. The decline of the Congress system and the dawn of the coalition era in New Delhi incentivized the growth of regional parties, whose leaders recognized that they would wield considerable influence in the formation of governments with a relatively small number of seats in parliament. Coupled with it is the fact that the scope of elections has increased dramatically over the two decades. India’s elected representatives increased from a little over 4,500 to nearly 3 million virtually overnight due to the introduction of 73 and 74 amendment acts which constitutionalized Panchayats and Municipalities in India Why candidates with criminal records may be involved in illegal activity that provides them with ample liquid financial resources. They tend to be strongly embedded in the villages and towns that make up their constituency. They accumulate resources through a local network and leverage their power within network structures to obtain political support from other members. Candidates tied to criminality, to the extent they are embedded within the larger social network are connected to labor resources that help them run campaigns. The book is pacey and pithy and cogently argued. It can be described as path-breaking and is must read for all those who wish to peep and comprehend the world of criminality and their entry into the empire of politics.